The Five of Pentacles is the fifth card in the suit of Pentacles. A quick look at the illustration gives a quick overview of the card, and it is not wholly positive. When it comes up in a reading, prepare yourself for news you hadn’t hoped for. The Five of Pentacles represents lacking, poverty, missing out and insecurities. Past – The Five of Pentacles in the Past position can represent a past time when you were poor, or missing out in a way. Maybe you couldn’t go somewhere or do something you wanted for reasons out of your control. If you stopped yourself doing something, it’ll be helpful to think about why, maybe you’ve set up self imposed emotional barriers. growing up in poverty and lacking can make us more grateful, which is a quality everybody loves to see in others. Present – The Five of Pentacles in the present position means life is tough, and doesn’t feel like it’s improving. You might have been through worse, you may not have. It could only be affecting some aspects of your life. If you are suffering, look to people to reach out to. You might think they can’t help you, but just telling someone will take the weight off. There is always help but we often shy away from it, and some prefer to suffer in silence. Try to reach out to others, and realise that eventually you will start to see the bigger picture and place yourself within it. Future – The Five of Pentacles in the future position suggests a future struggle that you will overcome. If you continue your life how you’re currently living it, it may be worse off in the long run. Are you taking advantage of something that is helping you out now? It won’t last forever. Try not to bring others with you if you have any destructive habits. Work / Education – The Five of Pentacles in regards to work or education suggests difficulty. It could especially mean a lack of work and an inability to sustain yourself. If you have any skills and potential customers, consider self employment and the various benefits it can bring. If you need money fast but you’re unable to find a job, consider aiming lower. Its tough to say, but we need money to live, and sometimes we need to take any job we can get. If you are employed, look for ways you can grow as a person in your job. Don’t let it consume your life and leave your free time lacking. Romance – The Five of Pentacles in romance is a mixed sign. Make sure you’re in a relationship (or single) for the right reasons, and spend some time to think if either of you are draining the other. 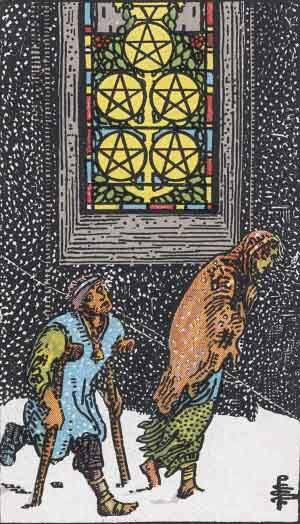 The sense of poverty in the Five of Pentacles suggests a potential breakup. With this in mind, don’t blow things out of proportion. There are issues you can work through that will seem mild at best when discussed. Friends – The Five of Pentacles in regards to friendship means things aren’t going well. Expect arguments or bad gossip now or in the near future. It might not be a good time to get into some deep conversations with your friends, but just keep things casual. You might be feeling lonely and as if you’re missing out on social situations. It might be true, and while it is a bad feeling, oyu need to ask yourself if you would prefer to be around people who might not want to be around you. Money – The Five of Pentacles in regards to finances isn’t a good sign. Poverty again shows it’s face here. You might especially feel like you’re stuck in a rut, and there’s no way out. A dead end job or too many expenses might be on your mind. There’s always a way out, and it might mean having to give up on something or sell something valuable. Health – The Five of Pentacles isn’t a good sign when placed for health. You could be in a period of stress or worry, especially regarding test results. Uncertainty may be an issue, so you may need to learn good ways to calm down your mind. Don’t overdo things, take it easy. Spirituality and Mentality – The Five of Pentacles in spirituality means that you might be feeling a little lost and drained. Have you lost the direction your life was going in? How can you get it back on track. It’s worth spending some time alone to think about these big questions. We distract ourselves daily, but it’ll be good to focus for a few times a week. In reverse, The Five of Pentacles shows some good qualities. Expect an end to any financial or material hardship. Have you just been ‘coping’ up until now? Expect this tough period to come to an end. You may feel like something is currently missing in your life. Maybe you do not have a larger goal, it’s likely that you feel without purpose in life. If this is the case, don’t worry. We all go through these periods. Purposes are not discovered usually, but gained through working at something long enough. Rarely is somebody born with an idea of what they want to do straight away. Try new things, the key is to always say ‘Yes’ when something new is proposed. Five represents energy, unpredictability and change. Five has a grand occult tradition; Pentacles and the five Chinese elements. The Five of Pentacles strongly represents your material wealth. Expect your material status to change dramatically soon. This sounds negative, but if you are struggling right now, it may be a change for the better. Be very focused on your finances right now. If you have many fives in a reading, it gives off a strong message that you’re in for some change very soon. We’ve selected live tarot readers to give you a FREE 3 Minute interpretation of The Five of Pentacles! Scroll through them below and pick your favorite one.